By 1987, when his initial efforts to accelerate economic growth had come to nothing, Gorbachev put the blame for the failures of his economic strategy on party officials reluctant to give up the old command-administrative methods. He referred to these conservative elements in the party and economic management collectively as the “braking mechanism” that stalled his plans of “acceleration.” He now felt that, without a far-reaching political reform that would sideline or remove these unwilling elements and release the energies of the masses, he would not be able to get ahead with the desired economic restructuring. The emphasis, accordingly, now shifted from economic reform to political democratization, which, together with glasnost, became the main catchword and the rallying cry of the second and final stage of Gorbachev’s reforms. Democracy was proclaimed to be the true essence of socialism that was to be reclaimed by transforming the command-bureaucratic system into socialism with a human face, or “democratic socialism.” The reforming leadership called for a greater role for workers in the running of enterprises and the greater involvement of the general population in the affairs of state and in the law-making activity. The new reformist strategy implied that a radical economic reform could begin only after society had been reenergized through far-reaching democratization. In practice this meant that the economic restructuring was postponed, surrendering the center stage to the propaganda and promotion of democratic principles. 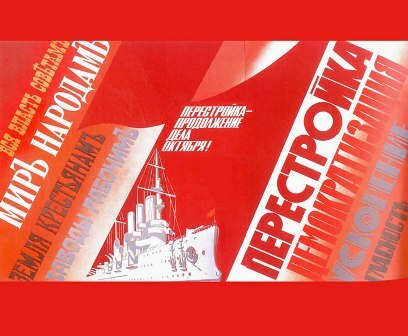 This shift of emphasis led to a deepening “westernization” of the Soviet reform process, as democratization was impossible without the introduction of certain elements and mechanisms from Western political systems. For some time, however, Gorbachev denied that democratization was aimed at borrowing “bourgeois” values and strove to prove that it was inspired by the ideals of Marx and Lenin. In reality, Gorbachev’s “new thinking,” as he called it, signified a revision of Marxism-Leninism and an attempt to incorporate certain new principles into Soviet socialist ideology, including civil society, the law-based state, parliamentarism, separation of powers, human rights, and, finally, the market—in other words, all those values that Marx and Lenin regarded as “bourgeois.” Gradually, Gorbachev and his supporters began to refer to these principles as “all-human” rather than strictly socialist.